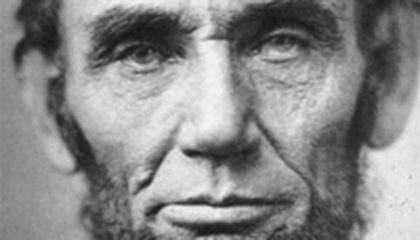 It's one of the most famous Abraham Lincoln photographs, largely because no one knew the picture of the president existed, until nearly a century later when the photo was found by a 14-year-old boy. Now Ronald Rietveld, the boy who made the discovery and is now a retired historian, will donate his original notes about the picture to the Abraham Lincoln Presidential Library and Museum in Springfield, Illinois. The photo marks one of the last chapters of a story that began in April 1865, just days after Lincoln was assassinated in Washington. On a stop in New York City, one of a number of places where Lincoln's remains were displayed while being taken by train to Springfield for burial, a photographer was allowed to take a picture of the president in an open coffin. Lincoln's secretary of war, Edwin M. Stanton, apparently heard about the photograph and ordered it and all prints and negatives destroyed. All were, except for one sent to Stanton. Rietveld enters the story in the early 1950s when, as a teenager fascinated with Lincoln, he attended the dedication of a collection of Lincoln-related items at the University of Iowa. Harry Pratt, the state historian of Illinois and a Lincoln scholar, was so impressed with Rietveld that he invited him to Springfield to see the 16th president's home and tomb. Pratt also let Rietveld look through papers of John Nicolay and John Hay, who were White House secretaries when Lincoln was president. Rietveld came upon an envelope sent to Nicolay in 1887 by Stanton's son, who explained that he'd found some of his father's papers and thought Nicolay might want them. "My first reaction was, 'This can't be,' because I knew Lincoln photography well enough to know there were no photographs of Lincoln in the coffin. There were no such pictures, period," Rietveld, now 77, said last week. Pratt told Rietveld to keep quiet about the photo until he could determine its authenticity. Rietveld boarded a bus with his secret and returned home to Iowa where he didn't say a word to anyone, including his mother. On the morning of Sept. 14, 1952, his mother shook him awake and told him that his grandfather had just called. A picture of Lincoln was all over the front page of the Des Moines newspaper, with Rietveld's name front and center. 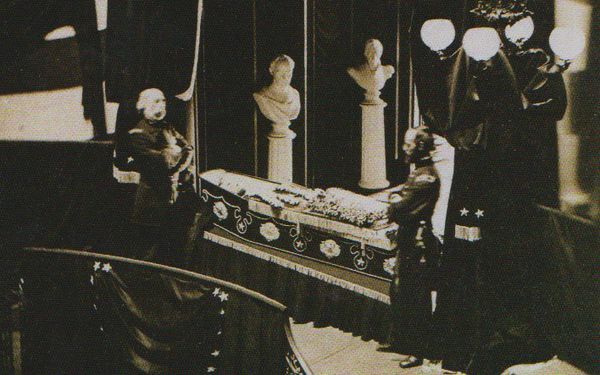 I think that finding an old, antique photograph of Lincoln's burial is actually really cool. I'm usually not that interested in history, but finding an old artifact is really cool, especially when you are only 14 years old. It was probably such a huge honor to have you name and photo printed in the paper when all you did was find a very important photograph. I wonder if I'll discover something and become the next Ronald Rietveld. A picture of Abraham Lincoln that no one thought existed was found over 50 years ago. AT the time the boy who found it was a fourteen year old from Iowa named Ronald Rietveld. The reason no one thought the picture existed was because all of the photos taken of Lincoln at an open grave were supposed to be destroyed. Rietveld was already fascinated with Lincoln before this in fact th only reason he discovered the photo was because he was invited by Harry Pratt to see Lincolns old home and tomb. This is when Rievtveld found the picture going through his fathers old files. I love how this happened. A 14 year old boy completely intrigued by Abraham Lincoln was able to be written into In to his history. I never thought about Abraham Lincoln in a coffin much less seen one. Its cool how a 14 year old boy found it when other much older people could have. The picture looks old and I can see Lincoln in the coffin which is cool. That is interesting to read about someone who was very interested in a historical figure and continues to explain and learn more about them. It's weird how no one knows it knew that the picture excited. It's also awesome how a 14 year old kid found this picture . This was a very interesting story. I've always found Lincoln to be one of the more interesting presidents to learn about in my history classes, though I think I'm good on ever seeing someone in their coffin again. Abraham Lincoln was buried in the Presidential Library and Museum in Springfield, Illinois. Because Lincoln was the 16th president they had send them to the museum for His history for our country. The photograph of Lincoln such an impact on the people so when he was brought to Springfield it had to be sent and had to be shown off The boy who had found this photograph was only 14 years old made an impact on the photography he then was all over the country. Harry Pratt, the state historian of Illinois and a Lincoln , was so impressed with Rietveld that he invited him to Springfield to see the 16th president's home and tomb. This young man has surprise many American he was very inspired by Mr. Lincoln. Who would've thought of the most famous photograph of Pres. Lincoln would have been by a fourteen year old boy .His name was Ronald Rietveld a retired historian who donated to his original papers with the information he had researched over the years. Abraham Lincoln is one of the most inluential presidents in history. He helped to end slavery. To find a picture of a man of such significants is a reward of it's own. Though it is taken after his death, it will only help to make his story known more. HE has been and will always be one of the United States' greatest men ever. I think that the reason Lincoln was taken Springfield Illinois because that is where he was born. His childhood also took place in Springfield. One more reason I think he was taken to Springfield is because his family lived there.